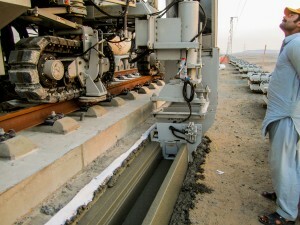 With mass transit in higher demand worldwide to east traffic congestion for commuters and tourists alike, the Saudi Railways Organization’s plan for a high-speed rail system will address the needs of Saudi Arabian residents as well as the millions of pilgrims who visit the country each year. 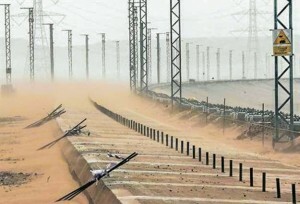 The Haramain High Speed Rail project, also known as the Western Railway, will stretch 281.5 miles (453 km) from Mecca to Medina, and is expected to carry 3 million passengers per year. The first phase of the project, the construction of the train stations, began in 2009. 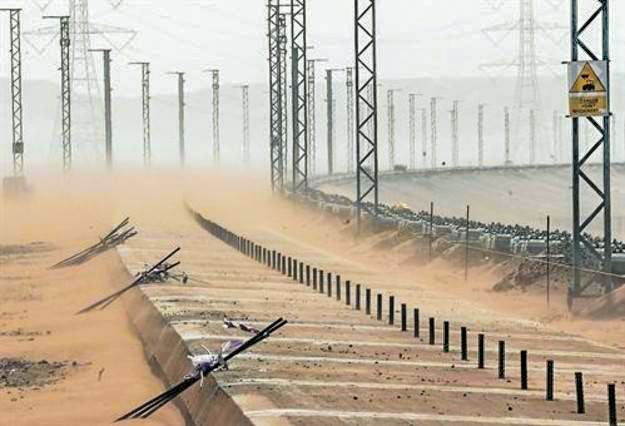 Stops along the high speed rail’s path will include Medina at the north end, King Abdullah Economic City in Rabigh, King Abdulaziz International Airport, Jedda, and Mecca at the southern terminus. Spanish contractor OHL is part of the Al Shoula Consortium, a group of 2 Saudi Arabian and 12 Spanish companies, responsible for Phase 2 of the job, which covers constructing the railbed and tracks, installing electrical and other utilities, signaling, and the trains themselves. 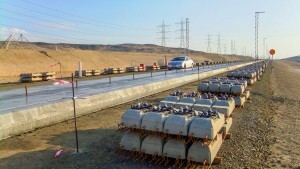 The cost of the project was estimated at $9.4 billion US (6.736 EUR). 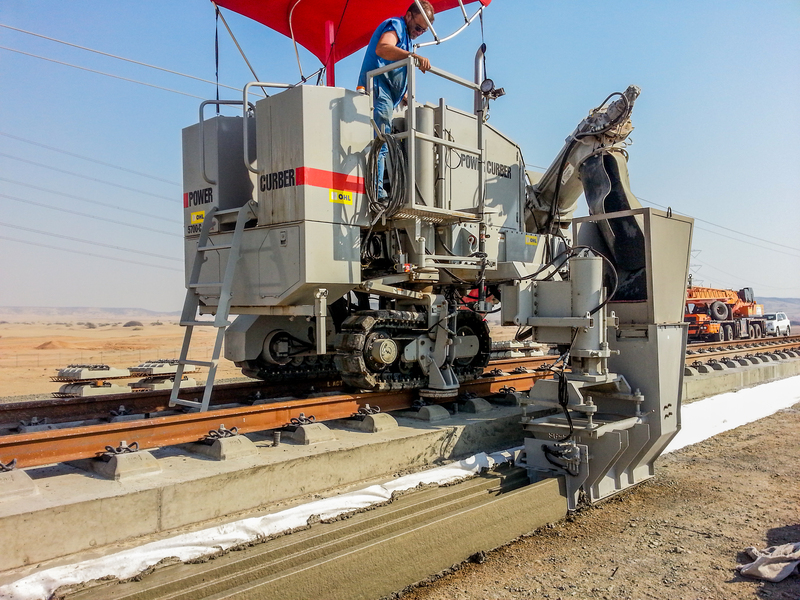 OHL purchased two Power Paver SF-1700 pavers and a Power Curber 5700-C-MAX to meet the strict requirements and tolerances for the railbed part of the project. 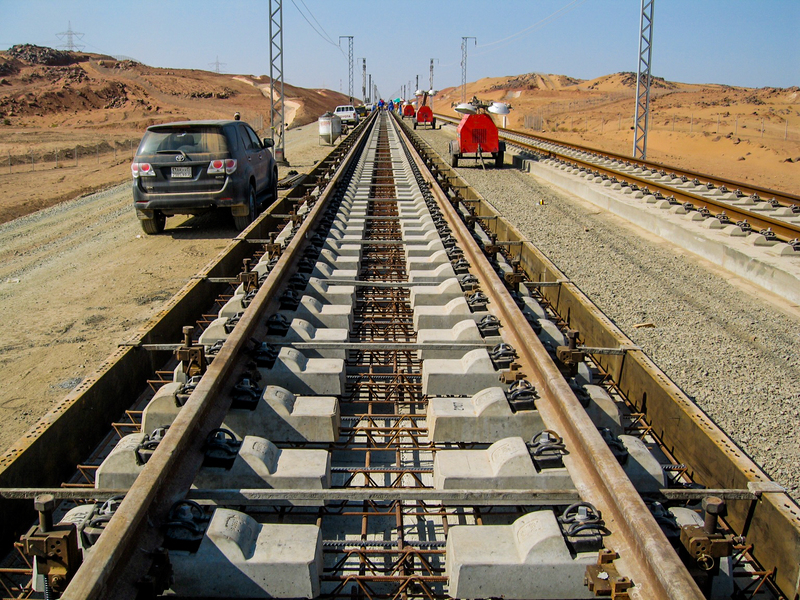 Most rail construction involves the use of ballast, typically a thick layer of jagged gravel, to help drain water away from the rails and also to bear the load exerted upon the railroad ties, also called sleepers. 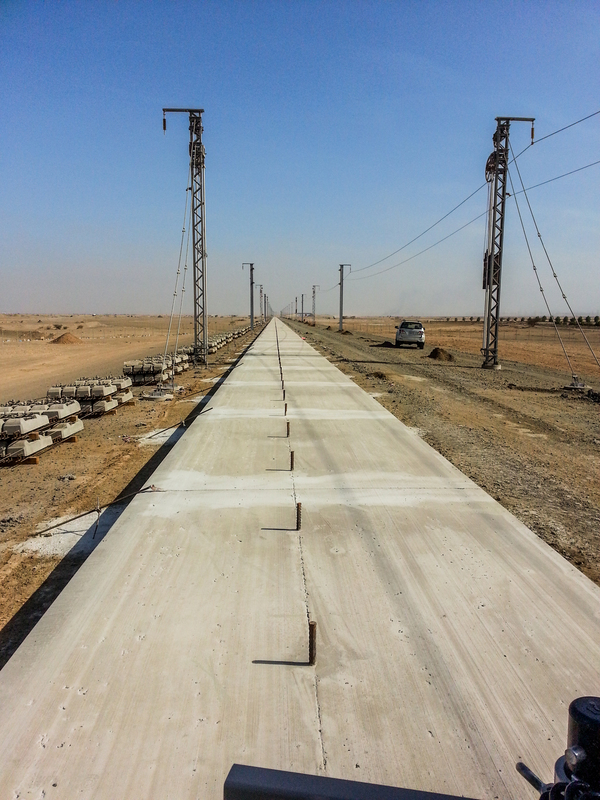 With train speeds up to 200 miles per hour (320 km/hr) combined with the harsh weather conditions in the Saudi desert and concerns that sand and high winds could collapse a conventional aggregate base, the decision was made to slipform a concrete base to install the sleepers on. 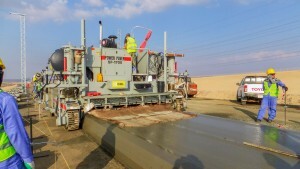 OHL used their SF-1700 to pave the first layer of the concrete base. “The slab was 3.6 m (12 ft) wide and the average depth was 30 cm (11.8 in),” said OHL Project Engineer Andres Arriazu. The slab had a variable cross-slope to accommodate the curves in the tracks. “In the curves, the depth was increased to 60 cm (23.6 in) on one side,” Arriazu said. They averaged 700 linear meters (2,297 ft) per day when pouring the base, with a 2 mm (0.8 in) window of accuracy. 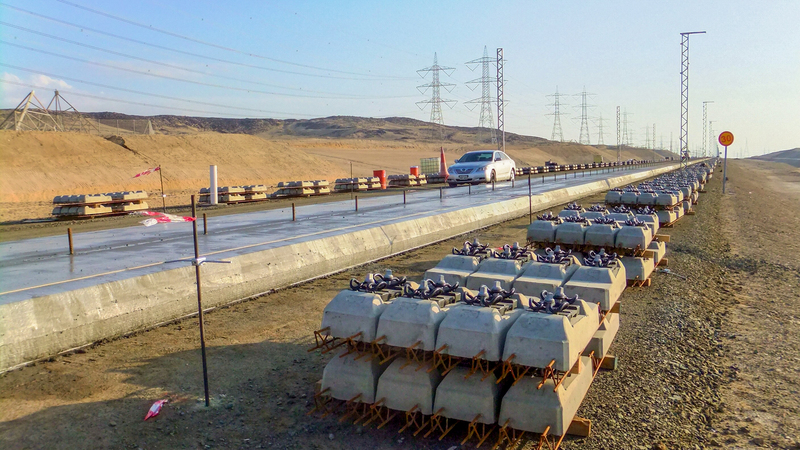 Precast concrete sleepers, 2.8 m (9.2 ft) long and weighing 300 kg (661.5 lbs), were then mounted on reinforcing steel on top of the slipformed base. The rails were then attached to the sleepers using laser-guided instruments and alignment to place the rails with +/- 1 millimeter per meter precision. 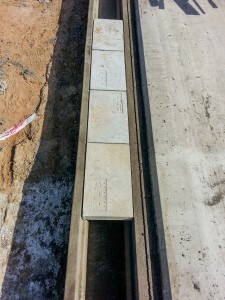 Concrete was then poured around the sleepers to form the second layer of the base. 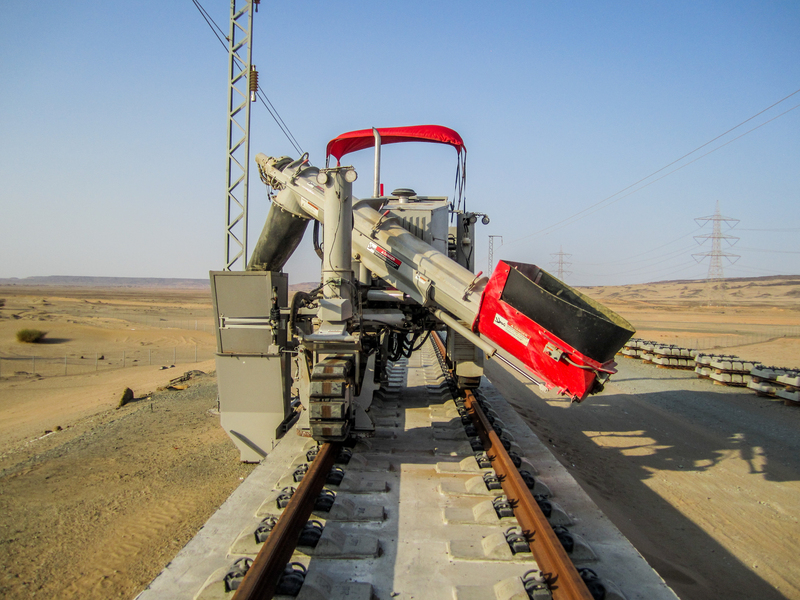 OHL was also responsible for installing utility channels that can be used to house electrical lines and signal track cables needed to operate the rail system. 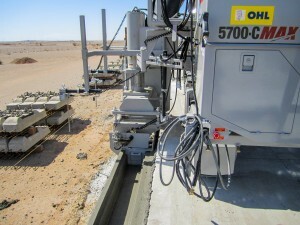 They used their 5700-C-MAX to pour the channels adjacent to the concrete base. In some sections of the job, the 5700-C-MAX ran on top of the base slab to slipform the cable ducts, using stringline guidance set off the side of the slab. In other areas, the utility channels were poured after the rails were in place. 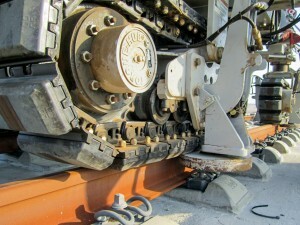 For those sections, the 5700-C-MAX was locked onto the rails with specially-engineered clamps and wheels that allowed the polyurethane tracks to ride on top of the rail. The rails were so accurately placed that the machine simply followed the rails and didn’t require stringline to control steering or grade. 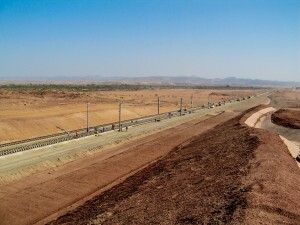 The utility channel was poured at an average rate of 1,000 linear meters (3,281 ft) per day, with the highest production day resulting in 1,400 m (4,593 ft) poured. Once the utility lines are installed in the channel, precast covers will be placed into the grooved tops to prevent sand from entering. With temperatures in the Saudi desert ranging from 0° C (32° F) to 50° C (120° F), special care had to be taken to ensure that the concrete would withstand rapid climate changes. This electrified double-track line is expected to transport 11,000-13,000 passengers during rush hours using 35 Talgo Class 102 and 112 Series trains. Each train will have the capacity for over 450 passengers. 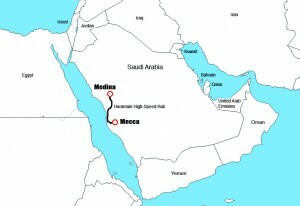 Traveling the 78 km (48 mi) fro Jeddah to Mecca will take less than half an hour. The 410 km (250 mi) between Jeddah and Medina will only take about 2 hours. 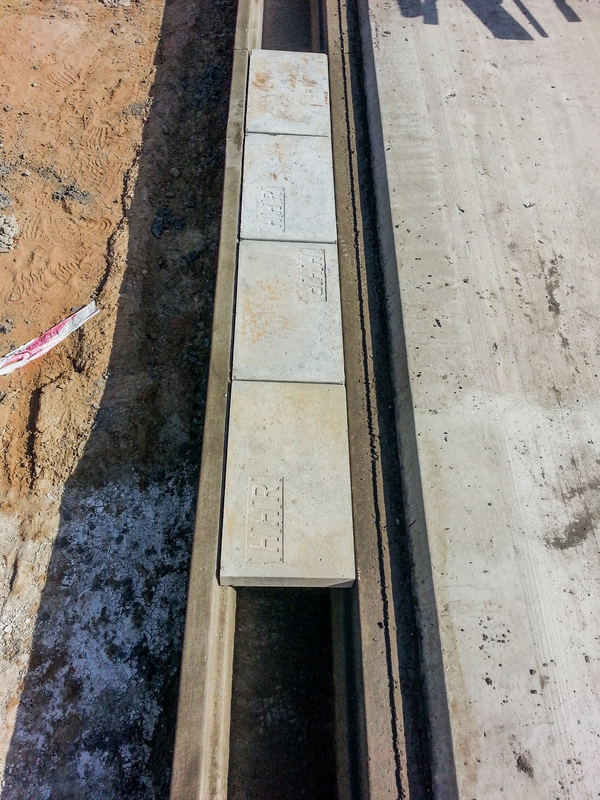 The concrete track slab and cable ducts have been completed. 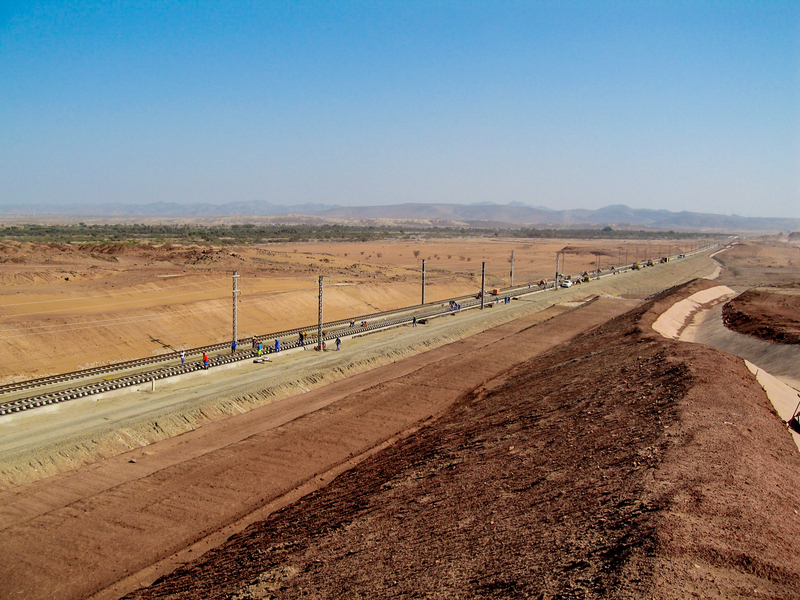 The railway is scheduled to open by the end of 2016.